The dough hook mixes and kneads yeast dough, saving both time and the effort of hand-kneading. The wire whip incorporates the maximum amount of air in whipped mixtures for fluffier whipped cream and angel food cakes. 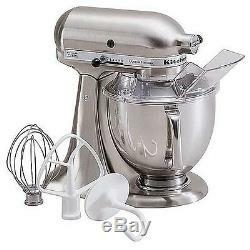 All attachments are solidly constructed, and attach easily to the stand mixer. The pouring shield fits around the top of the bowl and prevents ingredient splash-out. The chute makes it convenient and easy to add ingredients. The tilt-back mixer head allows for easy access to bowl and beaters. 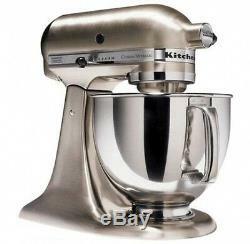 A lock lever holds the mixer head securely in place and the bowl fastens tightly to the base. From citrus juicer to sausage stuffer, KitchenAid stand mixers can handle just about any job in the kitchen. New from KitchenAid, the Custom Metallic stand mixer, in brushed nickel, adds a glistening prominence to your kitchen, with power and capacity to handle all your mixing, whisking and blending needs. The stand mixer has a 5-quart (or 9-cup flour) capacity, making it large enough for bread, cake and double batches of cookie dough. The stand mixer has the industry's best beater-to-bowl coverage - a 67-point planetary mixing action that reaches to the bowl's edges so every bit of batter is incorporated into the mix. Splattering is minimized with the pouring shield in place. The stand mixer is equipped with a high-performance, 325-watt motor, and comes with 10 speeds, offering versatility when mixing everything from stiff bread dough to egg whites. Its all-metal construction is sturdy and durable; the custom-plated finish is applied in five steps, helping to protect the stand mixer and offering lasting good looks. The tilt head design of the stand mixer lifts up for easier access to the spacious, all stainless work bowl. The work bowl has a contoured handle so it's easy to grasp. Included with your Custom Metallic stand mixer - a "C" dough hook, a dishwasher-safe, nylon coated flat beater and dough hook and a stainless steel wire whip. ATTENTION ALL CUSTOMERS: ALL ELECTRONIC ITEMS ARE 110V. 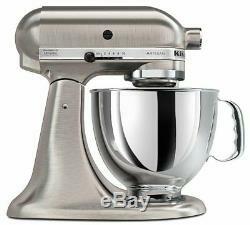 The item "KitchenAid Rk150nk All Brushed Metal Nickel Tilt Artisan Tilting Stand Mixer" is in sale since Tuesday, April 2, 2013.